E. had his first day in his new pool! It was finally warm enough and not raining!! We got his swim trunks on and all lathered with sunscreen. 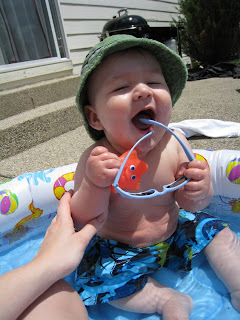 He had a blast splashing and playing with bath toys outside. 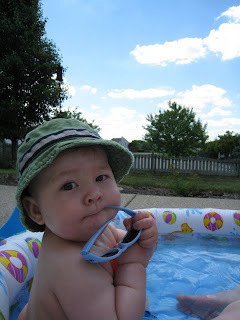 We spent about 20-30 minutes 'swimming,' although my allergies are raging with watery eyes and snotty nose today...yuck! Definitely a fun spring day!